Brandedcoffeecups.com are calling for the end to the throwaway culture of coffee cups. 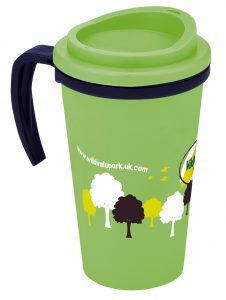 Following our success converting the use of re-usable plastic cups at festivals via our sister business branded-cups.com we are now proud to offer a range of re-usable coffee cups. According to The Telegraph only 1 in 400 cups are actually recycled. Telegraph : Just 1 in 400 hundred coffee cups recycled. Each year, 2.5 billion single use coffee cups end up as landfill. That’s why Brandedcoffeecups.com are delighted to be now offering an environmentally responsible reusable coffee cup made with natural bamboo fibre – one of the world’s most sustainable resources. It’s BPA and phthalate free with a capacity of 340 ml. Light, sturdy and fully dishwasher safe. It also has a resealable ‘no-drip’ lid. These cups are not suitable for microwaves. Bamboo is a wonderful material, as it’s naturally sterile. Bamboo actually neutralises bacteria left on the surface after 24 hours, which is perfect for use in food & drink products. Bamboo is very sustainable – it can grow a metre a day, meaning that growers have a fast renewing source of materials. Minimal heat is used during the production process. Our cups are dishwasher safe. We supply a variety of styles of our re-usable printed coffee cups. Available with different colours and option of silicone grip. The cups can be printed on the grip or directly onto the cup, with the option of a large wraparound print for a fantastic effect if you select a handle. Top rack dishwasher safe and BPA free with non-spill lids. 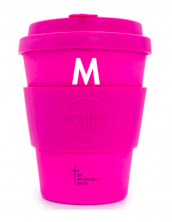 These re-useable coffee cups are a great alternative to disposable coffee cups. Ideal for both hot and cold drinks. Use it for tea, coffee, water or juice. They are heavier than a traditional paper cup but much lighter than a ceramic mug. Bespoke printing options are available, please enquire directly. Minimum order is 144 cups. Bestselling Americano Thermal Mug is modern designed and UK manufactured making it the ideal alternative to disposables. Double walled polypropylene material keeping drinks warm with 350ml capacity.